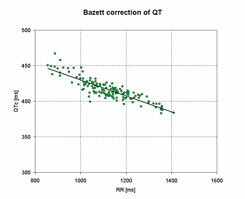 The use of conventional heart rate correction formulas (e.g. 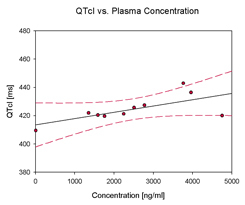 according to Bazett) in the assessment of drug-induced QTc prolongation is inappropriate, especially when heart rate changes are induced. 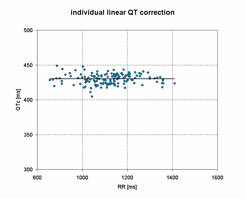 Since the relation between QT and RR is highly individual among subjects, we provide individual heart rate corrections for all studies, including first use in man studies. We provide detailed statistical reports of morphological and rhythm findings of all ECGs analyzed at ExCard. These findings can be separately analyzed for individual study visits and treatment groups. 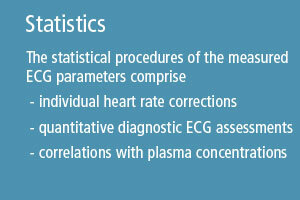 We also offer detailed statistical analysis of time matched ECG intervals and plasma concentrations. We deliver statistical reports based on your specific needs.